Capricorn Caravan Centre is proud to be an Authorised Dealer for Bailey Caravans. The Bailey Coastal Range is the perfect entry into caravanning life, built light enough to be towed by many popular, mid-sized cars and SUVs. Coastal is the perfect weekend getaway, just hitch up and drive to your favourite ‘coastal’ spot, plenty of storage, low maintenance features, small enough to store easily at home. Light, bright, breezy and won’t break the bank, the Coastal is certain to take you on an adventure. The compact yet spacious Coastal’s are packed with all your regular features and necessities of everyday living, without compromising on style. With a large L-shaped lounge seating, with a front centre island queen bed, reverse-cycle air-conditioning and rollout awning. The fully-equipped kitchen is one to be jealous of standard inclusions are a 164L fridge, 900w microwave oven, recessed cooktop with gas/electric burner and stainless steel sink. Cooking has never been easier in a caravan. Ultra-lightweight doesn’t even come close to describing the Coastal range. Being a single-axle and Weighing 1600kg* with a carrying capacity of 400kg* the Bondi can be towed by many popular mid-sized cars and SUVs. By being this light, the Bailey Coastal is an ideal caravan for most searching for the ultimate caravan experience on a smaller budget. For many Australians, the lightweight yet spacious Rangefinder Astro is the perfect ‘couples’ caravan. True ‘Aussies’ in their interior layout the Astro boasts a front queen island bed allowing the large ‘Skyview’ window to give full viewing access to the surrounds whilst being in the comfort of your home away from home. Loved by majority of the Australian Caravanners the Astro offers a full rear ensuite, central kitchen, with the option of a L-shaped or cafe dinette lounge seating format. These caravans are equipped with many high quality features and fittings including a full tunnel boot, one-piece fibreglass floor protection under shielding and a class-leading 210-litres of fresh water capacity for extended touring or ‘free-camping’. Inside features high quality fittings and appliances, including domestic quality Blum soft-close cupboard and drawer hinges, recessed LED strip lighting, the latest Thetford gas/electric cooking appliances with a glass-look kitchen splash back, a 185-litre three way, two door fridge, a powerful reverse-cycle air-conditioner and top-loading 2.5kg washing machine. with an unladen weight of 1800kg*, yet with a huge payload of 500kg*, the 20ft 2in Astro can be towed by a wide rang of mid-sized SUVs or 4WD vehicles, making them an ideal and economical travelling companion to explore every corner of our great country. A true travelling caravan, ideal for couples or friends the Cosmo is the perfect lightweight yet spacious travelling caravan. 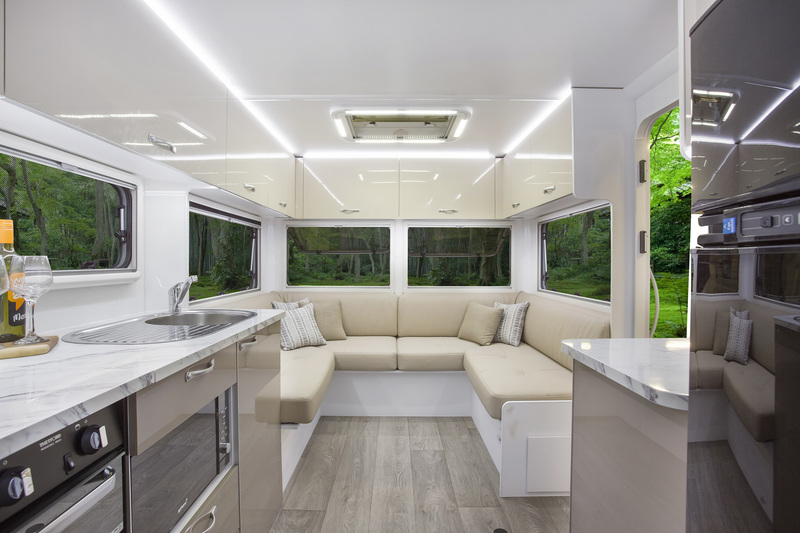 True ‘Aussies’ in their interior layout, Cosmo offers twin single beds at the front of the caravan allowing the large ‘Skyview’ window to give full viewing access to the surrounds whilst being in the comfort of your home away from home. 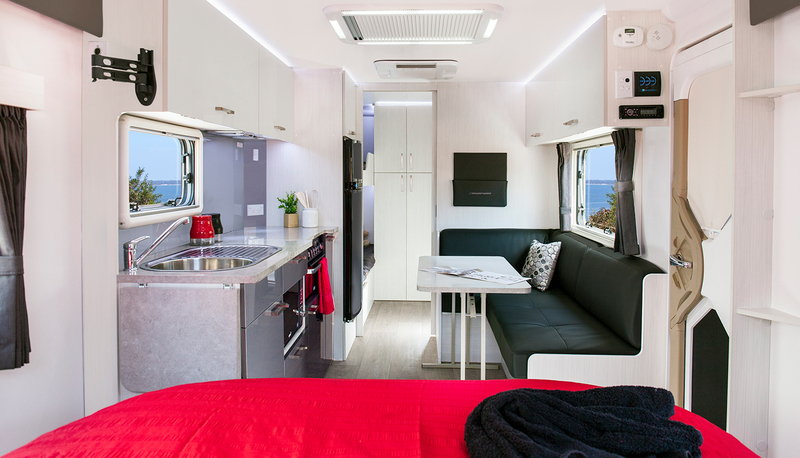 Loved by majority of the Australian Caravanners the Cosmo offers a full rear ensuite, central kitchen, with the option of a l-shaped or cafe dinette lounge seating format. These caravans are equipped with many high quality features and fittings including a full tunnel boot, one-piece fibreglass floor protection under shielding and a class-leading 210-litres of fresh water capacity for extended touring or ‘free-camping’. Inside features high quality fittings and appliances, including domestic quality Blum soft-close cupboard and drawer hinges, recessed LED strip lighting, the latest Thetford gas/electric cooking appliances with a glass-look kitchen splash back, a 185-litre three way, two door fridge, a powerful reverse-cycle air-conditioner and top-loading 2.5kg washing machine. with an unladen weight of 1800kg*, yet with a huge payload of 500kg*, the 20ft 2in Cosmo can be towed by a wide rang of mid-sized SUVs or 4WD vehicles, making them an ideal and economical travelling companion to explore every corner of our great country. There is no better way for an Australian family to explore or holiday in Australia than in a caravan, and the new Rangefinder Gemini is the perfect platform on which to build precious family memories. Combining an island front queen bed with twin rear bunk beds, a separate shower and toilet ensuite opposite, family caravanning has never been easier. Weighing 1950kg unladen, the Gemini is completely at home behind a medium SUV or 4WD, making it an economical and easy-to-tow companion. Featuring one-piece fibreglass floor protection under shielding, a full-tunnel boot, the latest vertical/horizontal signal antenna, an external bayonet gas fitting, external connection for a TV and a class-leading 210-litres of fresh water capacity, Gemini allows you freedom to enjoy travelling Australia’s wide open spaces. Gemini is comfortably equipped with high-quality cabinetry and fittings, the latest and most efficient kitchen, bathroom and comfort appliances and – importantly with a family van – a top-loading 2.5kg washing machine and a powerful reverse-cycle roof mounted air-conditioner as standard equipment. There is nothing better than being able to explore all that Australia has to offer with the ones you love. The Rangefinder Asgard allows you to take your family away to start creating a wealth of adventure, love, and fun memories. 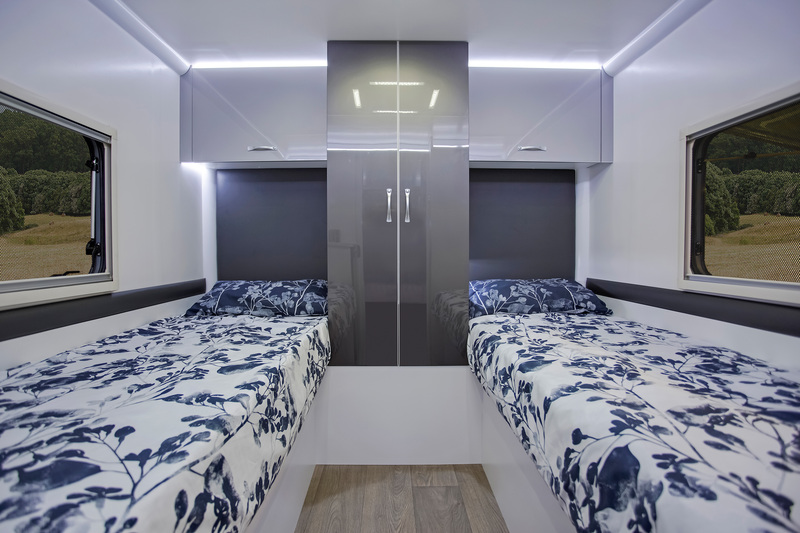 Allowing each special member of the family there own personal space, Asgard combines an island front queen bed with triple rear bunk beds, a separate shower and toilet ensuite opposite, travelling with a family has never been easier. Weighing 1950kg* unladen and offering a huge 500kg* of carrying capacity, the Asgard is completely at home behind a medium SUV or 4WD, making it an economical and easy-to-tow companion. Featuring one-piece fibreglass floor protection under shielding, a full-tunnel boot, the latest vertical/horizontal signal antenna, an external bayonet gas fitting, external connection for a TV and a class-leading 210-litres of fresh water capacity, Asgard allows you freedom to enjoy travelling Australia’s wide open spaces with the family. Asgard is comfortably equipped with high-quality cabinetry and fittings, the latest and most efficient kitchen, bathroom and comfort appliances and – importantly with a family van – a top-loading 2.5kg washing machine and a powerful reverse-cycle roof-mounted air-conditioner as standard equipment. Designed for couples – or a family of four – Rangefinder Nebula allows you to live in the lap of luxury while you lap Australia. A true entertainer’s layout, Rangefinder Nebula seats up to eight in its large front club lounge and is bathed in light by panoramic Skyview windows. Nebula is unique in its two separate entertaining/sleeping zones, cleverly divided by a door that can make the separate shower and toilet a bedroom ensuite, or open to visitors while the bedroom remains a sanctuary. The Nebula’s other unbeatable attraction is its unladen weight of 1950kg – hundreds of kilograms lighter than other locally built caravans of comparable size. Despite its light weight, the Nebula lacks for nothing, with standard features including reverse-cycle air-conditioning, a fully-equipped kitchen including a microwave, a large fridge/freeze and of course a top-loading 2.5kg washing machine. The only thing left to add is you. Designed for couples – or a family of four – Rangefinder Lunar allows you to live in the lap of luxury while you lap Australia. An entertainers delight in layout, Lunar seats up to eight in its large front club lounge and is bathed in light by panoramic ‘Skyview’ windows. Lunar is unique in its two separate entertaining/sleeping zones, cleverly divided by a door that can make the separate shower and toilet a bedroom ensuite, or open to visitors while the bedroom remains a sanctuary. The Lunar’s other unbeatable attraction is its unladen weight of 1950kg – hundreds of kilograms lighter than other locally built caravans of comparable size. Despite its light weight, the Nebula lacks for nothing, with standard features including reverse-cycle air-conditioning, a fully-equipped kitchen including a microwave, a large fridge/freeze and of course a top-loading 2.5kg washing machine. The entertaining lifestyle awaits, what are you waiting for? The Rangefinder Capricorn offers a new and luxurious way to holiday. Designed to suit many caravaners, the Capricorn can be a relaxing place for a couple – or a family of four. Entering via the rear door of the caravan you walk into a euro-style 8 seater rear club lounge with panoramic all round windows. Allowing you to take in the view from the comfort of your lounge. The Capricorn enables you to be at one with nature in the bedroom, where above a queen size bed is a large front window allowing you to lie in bed and take in the stars at night. Designed for couples or families, the Capricorn has the ability to separate entertaining/sleeping zones, a cleverly devised door separates the separate shower and toilet with the bedroom creating an ensuite, or allowing the lounge to be open to visitors while the bedroom remains a sanctuary. The biggest attraction is its unladen weight of 2000kg – hundreds of kilograms lighter than other locally built caravans of comparable size. Despite being lightweight the Capricorn still packs a punch with standard features including reverse-cycle air-conditioning, a spacious and fully equipped kitchen including a microwave, large fridge/freezer, and importantly a top-loading 2.5kg washing machine. Capricorn has everything you could need for your home away from home. So what are you waiting for? The Australian designed and built Rangefinder Comet is your luxurious home away from home – wherever you travel. Featuring a unique ‘flush-mount’ cassette-style slide-out wall with a retractable 32-in. TV at the foot of its Queen-size bed, the new Comet also boasts a huge front leather-look club lounge with seating for up to eight beneath panoramic Skyview windows, making it the ideal entertainer. Its spacious 6.6-metre interior length is home to luxury apartment-grade fittings that include reverse-cycle air-conditioning, a fully-equipped kitchen with a microwave, gas cooktop and a large fridge/freezer – plus of course a separate shower and toilet rear ensuite and a top-loading 2.5kg washing machine. Yet despite its impressive size and features when fully-expanded, the new Comet is significantly lighter and stronger than other comparable caravans, thanks to its patented Alu-Tech construction system that has been destruction tested under harsh conditions at the Australian Automotive Research Centre at Anglesea, Victoria. Uniquely, this allows the Comet to be towed by a wide range of medium-sized tow vehicles.